Lou Reed’s “Walk on the Wild Side” has become a symbol of sexual openness in the late 1960s and early 1970s. Even so, it is easy to feel that Reed’s engagement with matters of gender and sexuality is inadequate to the complexities of his subject matter. Set against a backdrop of musical irony and camp disavowal, the song all-too glibly presents the difficulties experienced by LGBTQ people, women, and people of colour. In this chapter, I argue that the song inherits its contradictory mix of sincerity and flippancy from Stonewall era representations of New York’s LGBTQ community. 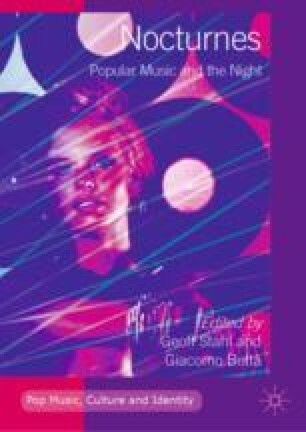 Reed provides a musical depiction of what the novelist John Rechy calls the City of Night, the nocturnal queer community hiding in the City that Never Sleeps. In this spirit, the record captures both a sensibility of freedom, the possibility and experimentation offered by the shadows, but also the darkened affect of a world experienced in terms of secrecy, defensiveness and shame. For better and worse, then, “Walk on the Wild Side” embodies the doubled hopefulness and despair of the City of Night. Boult, Adam. 2017. Is ‘Walk on the Wild Side’ Transphobic? Student Group Issues Apology After Playing Lou Reed Song. The Telegraph, May 19. http://www.telegraph.co.uk/music/news/walk-wild-side-transphobic-student-group-issues-apology-playing/. ———. 2018. The Sound of Subterranean Scuzz-Holes: New York Queer Punk in the 1970s. Popular Music & Society. https://doi.org/10.1080/03007766.2018.1483117. Goffin, Peter. 2017. University Student Union Takes a Walk on the Controversial Side Over Lou Reed Song. Toronto Star, May 22. https://www.thestar.com/news/gta/2017/05/22/university-student-union-takes-a-walk-on-the-controversial-side-over-lou-reed-song.html. Helmore, Edward. 2017. Lou Reed’s Friends Dismiss Claim That “Walk on the Wild Side” Is Transphobic. The Guardian, May 20. http://www.theguardian.com/music/2017/may/20/lou-reed-walk-wild-side-transphobic-lyrics-canada.